In time of peace long debate and comparatively careful deliberation usually precede the undertaking of new governmental activity. Responsible officials have time to select and train a departmental staff with care, and policies, procedures, and organization may be planned in relative leisure. The organization evolves and proliferates over a period of many years. new conditions develop gradually. New organizational arrangements become necessary, but they are usually made after extended debate and consideration. In war, the tempo of events in more rapid. Organizational changes must be made quickly and the situation may soon change fundamentally again with a consequent need for further organizational adjustment. The persons building an organization do not hope for permanence; they can only hope to bring together in a semblance of order a staff adequate to meet the current crisis. By the time the organization functions smoothly, new problems emerge and the direction of movement must be altered again. The process of making such adjustments in invariably slowed by the inertia of existing arrangements, and by the difficulties in reassigning personnel without irretrievably damaging morale. it is also complicated by human limitations in perceiving the precise nature of forthcoming tasks whose outlines often become clear only in retrospect. These limitations often compel adoption of stop-gap and half-way measures as steps toward more complete reform. various aspects of our economic and political foreign relations faced in the summer of 1943. The machinery which had been erected to deal with wartime questions of foreign affairs during a period in which we were building up our military strength for offense showed defects as we began to move into territory previously held by the enemy and to look forward to the problems of relief and rehabilitation sure to exist in the wake of the advancing armies. In keeping with the experience of World War I and with that of other countries, the facilities of our Department of State had been supplemented in various ways to cope with the problem of wartime foreign relations. The Office of Lend-Lease Administration had been created as an independent agency reporting directly to the President. It had remained under relatively close White House policy supervision because of the close connection between lend-lease transactions and high political and military commitments. its close alliance with the White House had enabled it to engage successfully in the inevitable battle against departments naturally unfavorably disposed toward using resources to aid our Allies rather than for the immediate strengthening of our own forces. Lend-lease aid was proving its worth; in the summer of 1943 the German offensive in the east was soon checked and late in August the Russians recaptured Kharkov. 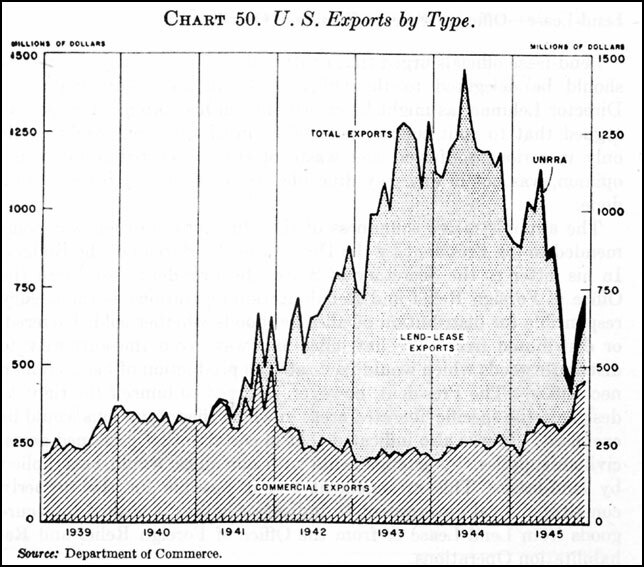 The Board of Economic Warfare (formerly the Economic Defense Board) had been established to control exports both positively and negatively, to see that friendly countries received from us goods essential for the maintenance of their economies and to see that goods from the United States and other sources subject to our control or influence did not reach the enemy. The Board also had a mandate to see that essential materials were bought abroad to meet our own needs and to prevent their falling into the hands of the enemy. In these activities it operated through subsidiaries, of the Reconstruction Finance Corporation, a peacetime agency which it had bene found expedient to retain and adapt to meet wartime needs. The Office of War Information had been established to undertake the dissemination of information abroad, information that would cement our friends more firmly to us and information that would upt fear and doubt into the hearts of the enemy. became embarrassing. Lend-Lease, BEW, the Department of State, the military, and other agencies of Government were all interested in the same area at the same time. Simplification of the administrative machinery was clearly indicated. The North African experience also stimulated speculations about the nature of the problems with which we would be faced as we moved into other enemy-occupied areas and about the type of preparations which should be made to meet them as they arose. At about the time the moral of the North African experience was being recognized, a weakness long latent in the machinery for the conduct of foreign economic affairs produced a crisis. The Board of Economic Warfare was responsible for policy decisions in Government purchases abroad, either to meet essential needs or to prevent goods reaching the enemy. Preclusive buying had to be carried on in such countries as Spain without much regard to fair price. A high price for a critical metal which might be sold to the Nazis might be a cheap price to pay for military safety. Subsidiaries of the reconstruction Finance Corporation, however, had the job of actually buying and paying for goods in accordance with BEW directives. The RFC had been manned by reputedly careful and shrewd traders, anxious to maintain a good financial record. Friction between the two organizations was inevitable; the boiling point was reached in the summer of 1943 with an unseemly display of accusations and recriminations by the heads of the two agencies. As military operations proceeded, it also became necessary to knit together more tightly the operations of different Governmental agencies. For example, when politico-military negotiations were under way which might lead to surrender, foreign propaganda needed to be most closely integrated with these negotiations. Illustrative was the furor raised by the use of the phrase "moronic little King" in reference to the King of Italy by the OWI in a broadcast last in July 1943. In discussion of the ousting of Mussolini, the OWI quoted this phrase from a column by Samuel Grafton. It acted in accordance with policy directives of its Overseas Planning Board, consisting of representatives of the OWI, State, War, and Navy Departments, and the Joint Chiefs of Staff, which permitted the identification of the King of Italy and Badoglio with Fascism. At the moment delicate negotiations were under way with the King and Badoglio which were to lead to unconditional surrender by Italy. It seemed clear that the State Department had not communicated fully to the OWI important changes in its plans and that the working staff of the OWI had dealt with an unexpected break in the news without consultation. peace" and whether we were adequately equipped administratively to meet the necessities of our postwar foreign policy.Considerations relating to the immediate necessities for the prosecution of the war, to the problem of arrangements for postwar relief and rehabilitation, and to the longer-term problem of machinery for the conduct of foreign relations combined to force action. Eighteenth-, nineteenth-, and, to a lesser extent, twentieth-century practice had been for peaceful international relationships to be handled through foreign offices. It has been the established practice of our Government that foreign governments could deal with the united States only through the Department of State and that American private and public bodies could deal with foreign governments only if authorized to do so by the Department. This traditional monopoly of foreign contacts was broken during the first World War when the necessities for speed and close collaboration brought the development of direct relationships between many governmental agencies other than foreign offices. The interwar period saw the development of many direct contacts between agencies of different governments concerned with technical and nonpolitical activities. With the outbreak of World War II, a continuation of this trend was inevitable. It also seemed inevitable, considering the habits of the Department of State, that its control over these relationships would be circumscribed. Questions on how these contacts were to be made and on the degree to which the Department of State should and could control such relationships arose early in the war. State and other governmental agencies remained unsettled, undefined, and often strained. Correspondingly, our relationships with foreign governments and international organizations were often confused and ineffective. The [Economic Defense] Board does not intend to supplant the Department [of State] in terms of staff or policy, but it will be necessary that the Department supply the Board with full information on its activities in . . . the field of economic warfare and postwar international economics as well as full response from its field missions. Even at this early date, there was some criticism of the Department, including charges that it refused to supply some of the new defense agencies with the reports which they required. The departmental practice of paraphrasing messages )to protect its codes) before transmitting them to the interested agencies led to the charge of misrepresentation and of incomplete reporting. Long-standing difficulties on these points had been experienced in the relationships between the Department of State and the Departments of Commerce, Treasury, and Agriculture. And they gave warning of the difficulties likely to be encountered by new agencies entering the foreign field. Several proposals for the consolidation of such activities, both within and without the Department of State, were put forward. it was not, however, until the explosive airing of differences between Henry Wallace and Jesse Jones that a degree of consolidation was achieved. Why were the new agencies created, allowed to grow, and given an opportunity to take on institutional habits and interests outside of the department normally responsible for handling foreign relations? In view of the difficulties encountered, why was the consolidation so long delayed? service tradition, procedure, and tempo. The Department was not equipped with the technical personnel, or with the experience necessary for the day-by-day activities in such fields as export control, preclusive buying, the business details of lend-lease, and the conduct of psychological warfare. For these and other reasons, the emergency agencies sought to operate directly with only the unavoidable minimum of control by the Department of State. The direct relationships between departments of the governments of allied nations sometimes were institutionalized in forms that omitted the foreign offices completely. The Combined Chiefs of Staff furnishes an illustration both of these combined agencies and of the forces that break the monopoly of external affairs held by foreign offices. Anglo-British [sic: should be "Anglo-American"] military collaboration could have been difficult had the United States military leaders dealt with our State Department, which in turn communicated with the British Foreign Office, which consulted with the British military, and then eventually relayed the reply through channels to the mililtary officials of the United States. Circumlocution of this sort could have lost the war; it was more sensible and more convenient for British and American military leaders to sit at the same table and negotiate directly with each other. Somewhat similar considerations led to the erection of other combined boards: the Combined Food Board, the Combined Raw Materials Board, the Combined Production and Resources Board, and the Combined Shipping Board. Traditionally, the definition and announcement of our foreign policy was the responsibility of the Department of State. Strong considerations urged a degree of coordination of the many agencies where operations impinged on our foreign policy. The organizational problem, therefore, became that of finding means of coordinating the functions of the several agencies within the framework of policy decisions established by the Department and the President. Difficulties encountered in drawing the line between policy determinations and daily operations were present in the foreign and domestic activities in all fields. Despite many operational difficulties, however, the principle was consistently maintained that all of the agencies operating in the field of foreign relations did so under policies developed or approved by the Department of State. during the summer months of 1943, and illustrated a number of basic administrative problems. Negotiations regarding the establishment of an international agency designed to aid in the prompt relief and rehabilitation of eligible nations got under way in 1942 and 1943. The landing of Allied troops in Africa intensified these negotiations and, in order to prepare our Government for participation in such a program, the President appointed Governor Herbert H. Lehman Director of the Office of Foreign Relief and Rehabilitation Operations. Mr Lehman resigned as Governor of the State of New York on December 2 and was sworn into his new office on December 4, 1942.1 The new Director was given the job of mobilizing our resources for the enormous humanitarian job ahead. While the Office was established within the Department of State, almost complete freedom of action was apparently contemplated, the Department was only a convenient place in which to place OFRRO pending the creation of an organization of nations to deal with relief and rehabilitation. As soon as OFRRO was established, however, a host of jurisdictional and operating problems beset it both in Washington and in the area of its foreign missions. Some of this confusion seems clearly traceable to the fact that no formal Executive order had been issued and partly to the hasty or casual way in which the Department of State established the Office. The new Director relied upon his recollection of oral commitments as to the scope of his authority rather than upon more formal or written statements. Some of the difficulty is also traceable to the fact that both coordinating and operating functions seem to have been lodged within the agency. Relative to other Governmental agencies, OFRRO found itself in the position of both advocate and judge. Under such conditions critical disagreements and jurisdictional conflicts were inevitable, even with the best of good will. To these factors must be added the usual growing pains of a new agency. through the provision of food, fuel, clothing, and other basic necessities, housing facilities, medical and other essential services; and to facilitate in areas receiving relief the production and transportation of these articles and the furnishing of these services. In planning, coordinating, and arranging for the administration of the above mentioned work, you may utilize the facilities of the various Government departments, agencies, and officials which are equipped to assist in this field and you may issue to them such directives as you deem necessary to achieve consistency in policy and coordination in administration . . . Shortly after this letter, the Director left for London to discuss the pressing problems of relief and rehabilitation with the American and Allied military and civilian personnel. Upon his return to this country, Mr. Lehman determined upon a vigorous program. He had received very find cooperation from all parties in London and felt that vigorous action was imperative to the successful execution of the program entrusted to him by the President. He therefore prepared and sent on May 8 to all the Government agencies concerned, both military and civilian, a memorandum entitled "Statement of Policy for Relief and Rehabilitation in Future Liberated Areas." Relief consists of furnishing the essential goods, facilities and services required by civilian populations, irrespective of the mode of distribution, whether by gift, sale, or barter. Relief cannot be limited to free distribution if we are adequately to utilize resources in liberated areas and to avoid the necessity for and the waste of a double supply line. to "make easier the transition to any United Nations relief organization that might hereafter be established." Once the responsibility for administration of relief and rehabilitation passed from military to civilian hands, Mr. Lehman stated that it was his responsibility "to control . . . the entire civilian supply for the particular liberated area." It would thus be necessary for OFRRO to formulate requirements for submission to the Lend-lease Administration "and to the appropriate commodity control agencies," such as WPB and War Food Administration. He also reserved to OFRRO "direction of the distribution of all civilian goods imported into the liberated areas." With respect to operations in the field, the Office of Foreign Relief and Rehabilitation Operations must and does assume responsibility for the selection and direction of the Chief and members of the relief and rehabilitation mission in each liberated area. The mission chief will be answerable to me, as Director of the Office of Relief and Rehabilitation Operations, and his charter of operations will come from me. While OFRRO was working to establish its role as the coordinating and operating agency in the field of relief and rehabilitation, steps had been taken to strengthen the coordinating function in the Department of State. On May 8, the day on which DIrector Lehman issued his statement of policy, the President signed a letter requesting the Secretary of State to establish coordinating machinery, within the Department, covering the general field of foreign economic activity, including foreign relief and rehabilitation. During the ensuing month, discussions and conferences were held in order to reconcile the differences of opinion and program between the proposal of May 8 and the statement of policy as announced by Director Lehman. As a result, a new draft of the letter to the Secretary of State was developed and sent to him on June 3, 1943. The letter vested in the Department of State full responsibility for coordinating the economic operations of civilian agencies in areas liberated from enemy control. The President emphasized the necessity for cooperative action among all civilian and military organizations in liberated areas. Furthermore, he defined the functional assignments already granted to the civilian agencies. Chart 49. 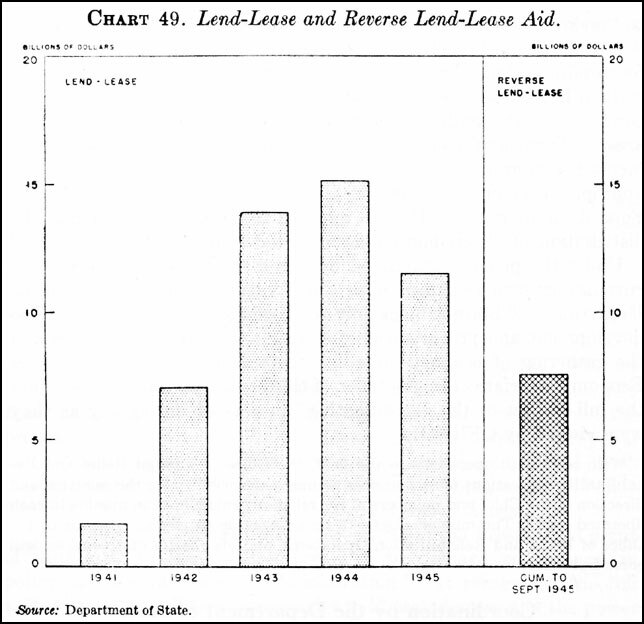 Lend-Lease and Reverse Lend-Lease Aid. In addition to the Department of State, those agencies concerned were the Office of Foreign Relief and Rehabilitation Operations, Office of Lend-Lease Administration, Board of Economic Warfare, and Department of the Treasury. The War Department and the Navy Department also were concerned because both had been insisting for some time that they deal only with a single responsible civilian agency in place of a number of independent civilian agencies and programs. There were two areas in which clarification was needed in order to avoid possible disagreement and to achieve smooth interagency relationships and operations. Both of these dealt with relations between the Office of Foreign Relief and Rehabilitation Operations and the Lend-Lease Administration. These issued related to: (1) control of distribution in relief areas of free goods and those bartered or sold; and (2) the question of which agency should act as claimant for relief areas before the various allocating boards, such as the War Production Board. Lend-lease officials urged that control of all but "charity" materials should be delegated to the Office of Lend-Lease Administration. Director Lehman, as might be expected from his statement of policy,m argued that to split such responsibility in distribution would result only in serious confusion and waste of effort. Distribution, in his opinion, was not in any way divisible--if an effective job were to be done. The administrative soundness of the Director's position was commended to the President by the Director of the Bureau of the Budget. In his letter to the Secretary of State, the President designated the Office of Foreign Relief and Rehabilitation Operations as the agency responsible for distribution of all relief goods whether sold, bartered, or distributed free. To that office also was given the authority to distribute goods which would facilitate the production of basic civilian necessities. The President, however, reserved to himself the right to designate the specific liberated areas in which these functions would be exercised. It was also indicated that in certain other unnamed areas, civilian supplies, by arrangements with our allies, would be supplied by lend-lease. This arrangement left it possible for the properly constituted local government to indicate whether it wished to secure goods from Lend-Lease or from the Office of Foreign Relief and Rehabilitation Operations. Chart 50. U.S. Exports by Type. an opportunity to present its case on any shifts which might be recommended by Lend-Lease. The Presidential letter also took cognizance of the fact that the appearance of a United Nations relief organization would necessitate a redefinition of this interagency relationship. Thus, there continued to be a large measure of uncertainty and interagency conflict was not settled. The Office of Foreign Relief and Rehabilitation Operations was specifically granted the responsibility for the provision of technical advice and services for relief operations, plus the facilitation of agriculture, housing, and transportation in relief areas. The Board of Economic Warfare already possessed authority in the field of agricultural rehabilitation and had undertaken certain construction programs. It was pointed out by the President that OFRRO would be expected to take full advantage of this going service. The Board of Economic Warfare was also expected to continue its activities in the procurement and development of critical materials, in compilation of economic intelligence, and in other activities of economic warfare. It would also act as a consultant on all related technical matters. of responsibility delegated to the Treasury Department. It was to continue its activities in the fields of fiscal control, exchange rates, and so on. There was general approval of the purpose and plan of the new organization. Detailed discussion among the agencies concerned brought substantial agreement on the operational feasibility of the proposal and on June 24 the Secretary of State signed an order creating the Office of Foreign Economic Coordination within the Department. This new office was placed under the direction of Dean Acheson, Assistant Secretary of State. Soon thereafter, Thomas K. Finletter was appointed executive director and he began to recruit personnel. During the following 2 months, there were many discussions and conferences, and there seemed to be an improvement in interagency relationships. SUrface indications, however, were deceiving, as events during July and August were to show. major problems remained unsolved--any one of which might well be crucial to the successful operation of the plan of June 3. The President has not yet indicated . . . whether OFRRO or OLLA will be responsible for the distribution of civilian supply in liberated areas. Until this is done,l it will be impossible for OLLA, OFRRO, and indirectly OFEC, to recruit their personnel and lay their plans for those areas . . . The extent of the coordinating authority of the State Department is still very much in dispute. The State Department maintains that it must have enough power--in respect to personnel, the clearance of communications, etc.--to properly coordinate the activities of the operating agencies. Some of the agencies, however, insist that the State Department plans to operate as well as coordinate . . . The Secretariat . . .and the central organization for OFEC, have not yet been established, and little or no progress has been made in recruiting the staff . . .
No agreement has so far been reached between the military and civilian agencies with respect to supply during and following military occupation. Without knowledge of the military procurement progress, the civilian agencies are completely unable to make plans and begin procurement. During the interim between the Presidential letter and the report of the Bureau of the Budget, a number of detailed problems developed. Precisely how was the State Department to coordinate the operations of other agencies? Action by the Department of State made it appear to the war agencies that the Department was extending its jurisdiction by a very broad interpretation of the meaning of "coordination." All sides admitted that the line between "operation" and "coordination" was an extremely difficult one to draw; the various agencies concerned, however, were made specifically responsible, by statue and by Executive orders, for operations in various segments of our total foreign economic activities. All the agencies agreed upon the need for a unified foreign economic program; they would not agree on how to attain it. each committee to have the responsibility for developing plans and programs to guide agency operations in the various liberated areas. These committees were to be interagency in composition, were to report to the Executive Director of the Office of Foreign Economic Coordination, and were to provide the channel through which the regular machinery of the Department of State would be meshed with the activities of our civilian and military agencies and allies. The field organization prepared by the State Department provided for the selection of an area director for each of the liberated areas. This director was to be subject to the orders of the military commander but was to act within the policies established by the policy committee in Washington. He also would be specifically responsible for keeping the State Department fully informed of all activities in his area. The area director was to be the major channel of contact, in the field, between the civilian and military agencies of this Government. The plan also contemplated the speedy despatch of both communication and personnel to and from the liberated areas. Prior to the issuance of the formal State Department order creating the Office of Foreign Economic Coordination, the department requested the aid of the Bureau of the Budget in making adjustments necessary to carry out the coordinating duties imposed by the Presidential letter of June 3. Plans presented by the Department for a rather large staff were discouraged on the grounds that a large staff invited almost certain duplication of personnel and that operation rather than coordination would become inevitable in such a situation. It was emphasized that coordination was the function assigned to the Department and that this might be accomplished best by the establishment of a suitable secretariat. Such a secretariat, designed to service the several committees, was viewed as the strongest coordinating device possible under the circumstances. This position was in line with the Presidential intention, as expressed in the letter of June 3, to emphasize the coordinating function of the Department of State and to leave the day-by-day job to the various agencies concerned. The Department accepted this point of view, but, as has been pointed out, nearly 2 months elapsed before even a skeleton organization had been established. This lack of a Secretariat made the coordinating function a difficult one to establish. and such action was necessarily slow. Various interagency committees established by BEW, OLLA, OFRRO, and other agencies concerned with our foreign economic activities, had to be surveyed. These committees had been established in order to accomplish, on a more limited scale, coordination of our foreign economic activities. The dissolution of these committees and the consolidation of some of them with the new coordinating mechanism of the Department of State took considerable time. While these organizational problems were being reviewed and their solutions sought, the Executive Director of OFEC was carrying on discussions with military officials to determine the number of area committees needed and to develop operating procedures satisfactory to both military and civilian agencies. At the first meeting of the Policy Committee, held on June 17, the Assistant Secretary of State presented an outline of the ground rules and plans for activities as approved by the appropriate military officials. It was agreed that there should be an "area committee" for each of 12 areas designated by the Army, and in subsequent meetings the procedures to be used in operating in each area were considered. The area committee was designed as the point at which all proposals, policies, and studies from the various agencies could be brought together to develop a single coordinated foreign economic policy and plan of action. Such a unified program could then be fitted into the military and diplomatic picture as it changed from day to day. The agencies, however, seemed to view these committees as the place where most of the detailed planning was to be done. The Executive Director of OFEC did not believe that either policies or plans could be made in committee. In his opinion, the best device was the use of a standard operating procedure, which he had developed in consultation with the military officials. The failure to consult also with civilian agencies contributed to subsequent friction. The struggle over the proper demarcation between coordination and operation again provoked vigorous discussion. The standard operating procedure for supply, as presented by the Executive Director of the Office of Foreign Economic Coordination, appeared to place OFEC in the position of the procuring agency as well as the advocate before the various allocating boards. Strong objections were voiced to this position as being in direct conflict with the intention if not the letter of the presidential delegation of authority to the Department of State. Operations, the Office of Lend-Lease Administration, and the Office of Foreign Economic Coordination met for the purpose of discussing a revision of the standard operating procedure. At this time, two drafts were considered: one, pertaining only to the War and Navy Departments, and previously approved by the Civil Affairs Division of the War Department, provoked no comment; the other, dealing with civilian supply arrangements, was vigorously opposed by the Office of Foreign Relief and Rehabilitation Operations. The Director of that office maintained that draft sections as presented, providing for the transportation and distribution of supplies, made the Department of State the operator and left OFRRO in a purely "planning" position. The Executive Director of OFEC avowed that the intent of the document had been misunderstood, that the OFEC had no desire to undertake any operating responsibilities, and that such responsibilities were the specific duty of OFRRO. Counter-proposals were prepared and presented by BEW, OFRRO, and Treasury Department. A meeting of minds seemed increasingly difficult to accomplish. Out of these events the impression emerged that the Department of State, if left to its own inclinations would not utilize the interdepartmental machinery in the fashion intended under the original plan. The impression also remained that a large staff necessarily would be developed under the standard operating procedure. Difficulties seemed so formidable that plans for the consolidation of the agencies acting in the international field into a single agency outside the Department of State were revived and reviewed. A statement be issued reaffirming the authority of OFRRO in respect to the total relief and rehabilitation job. OFRRO should be free to prepare relief and rehabilitation plans without interference except for necessary coordination with the programs of other agencies. Adequate supply reserves should be guaranteed for OFRRO. Ample funds should be set aside for OFRRO's use. OFRRO's freedom to operate should be subject only to the policy controls of the Secretary of State and the military, and the coordination of the area director. On September 4, the Secretary of State forwarded a memorandum to the President setting forth the position and recommendations of the Department. Secretary Hull pointed out that relief and rehabilitation represented but one segment of our total foreign policy and that responsibility for total coordination was, in his opinion, properly placed in the Department of State by the Presidential action of June 3. He regretted exceedingly that the relationship between the Department and OFRRO had not been as cordial as those between the Department and other agencies but was convinced that the proposal he was presenting to the President was administratively sound and workable. He was certain, however, that the experience of three months indicated the need for "clarifying the authority of the State Department" in its role as coordinator. It is accordingly recommended, for the President's consideration, that he authorize the Department of State, in any instance where there shall be a conflict of view between two or more interested agencies, or where in the Department's opinion an element of foreign policy is involved, or where some procedure must be established among our own agencies or with our allies, to make the necessary decision and to cause it to be carried into effect. I should like you to know that I left your Office deeply impressed at your earnest desire that the civilian agencies have authority to fulfill their responsibilities and that the activities of OFEC be confined in fact as well as in word to the coordinating function, which, we all agree, is necessary for consistence in American foreign policy in liberated areas. The solution to this problem came from quite a different source, partially domestic and partially international. Even before the State Department and OFRRO became involved and bogged down in the process of devising machinery to coordinate our foreign economic policy, relations between to other agencies--the Board of Economic Warfare and the reconstruction Finance Corporation under the supervision of the Secretary of Commerce--had been simmering. At the end of June 1943, they reached the boiling point. On June 29, the Vice President, as Chairman of the BEW, released to the press a series of charges against the Secretary of Commerce. This was followed, 6 days later, by the reciprocal charges of the Secretary of Commerce. In order to secure an understanding of the forces behind this public display of differences, it is necessary to review briefly the administrative background of the conflict. of BEW. Furthermore, BEW was given the authority to advise the State Department with respect to the forms and conditions to be included in the lend-lease "master agreements." The Board of Economic Warfare would thus act on directives from the War Production Board, issue directives to the Reconstruction Finance Corporation and advise the State Department in the field of international economic relations. The Board of Economic Warfare, however, was granted the authority to send technical, engineering, and economic representatives into foreign countries. Such appointments were made subject to the approval of the Department of State. This Executive order provoked considerable protest. The protests were due to conflicting convictions regarding the proper role of economic warfare in the field of foreign affairs. In the view of the Department of State, economic warfare was a tool of diplomacy. The point was made that at the heart of our foreign policy was the question of what would we ask in return for lend-lease. Preclusive buying, supplying goods and commodities for rehabilitation purposes, export control--these and other actions were, in the opinion of the Department, devices for strengthening our bargaining position in foreign affairs. The Reconstruction Finance Corporation had been established for the purposes of strengthening the business community of the Nation. It was inclined to view foreign purchases and foreign financial commitments from the point of view of accepted business practices. As Mr. Jones stated in his reply to the charges made by Mr. Wallace: "The Reconstruction Finance Corporation does not pay $2 for something it can buy for $1. "6 In the opinion of the CHairman of the Board of Economic Warfare, this was good business but hardly economic warfare. The Board was concerned solely with the basic problems of securing adequate goods and materials in the shortest possible time and keeping all such goods out of the hands of the enemy. Costs, protocol, and postwar diplomatic relations were secondary to the task assigned to the Board of Economic Warfare. Executive Order No. 9128 did not reconcile these conflicting points of view. It simply placed the Board of Economic Warfare in a better position to define its responsibilities. Export control (with the exception of lend-lease), import control (under directives from the War Production Board), and the sending of economic missions abroad (upon the approval of the Department of State) were the functions of the Board of Economic Warfare. were peaceably and amicably consummated by the two organizations during these months. Unfortunately for the speedy prosecution of the foreign procurement program, the periods of peaceful relations between the Board of Economic Warfare and the Reconstruction Finance Corporation were of short duration. It could hardly be otherwise with the separation of financial control from operational and policy control and with the fundamental difference in point of view between the personnel of the two organizations. The President's Executive Order No. 9128 gave (the) Bureau [sic] of Economic Warfare authority to issue directives to the Reconstruction Finance Corporation with respect to foreign purchases. That Mr. Wallace's own Order No. 5, issued while the President was in Casablanca, has equal force is open to serious question. Under Mr. Wallace's Order No. 5, officials of the Reconstruction Finance Corporation are allegedly given no choice but to sign, without question or inquiry, any contract to make any commitments which the Board of Economic Warfare negotiates and prepares and gives a directive for, regardless of the terms and conditions of the contract or the extent of the Government obligations assumed . . .
for the purpose of preclusive buying. The understanding, however, came to naught because of Mr. Jones's objections to the clearance of the arrangement in the customary manner through the Bureau of the Budget. The public controversy between the Chairman of the Board of Economic Warfare and the Secretary of Commerce furnished the occasion for initiating steps leading to a greater degree or organizational consolidation of foreign-affairs functions carried on by agencies outside the State Department. After the two officials carried their cases to the press, the President, in line with a policy announced during the heat of the rubber controversy in the fall of the previous year, solved the immediate problem by removing Mr. Wallace and Mr. Jones form their respective posts as Chairman of the Board of Economic Warfare and Director of the RFC subsidiaries in the field of foreign procurement. This announcement was made on July 15, 1943. At the same time, the President abolished the Board of Economic Warfare and transferred its functions to a newly created Office of Economic Warfare. The USCC, the Rubber Development COrporation, the Petroleum Reserve Corporation, the Export-Import Bank of Washington, "and all other subsidiaries of the Reconstruction Finance Corporation which are now engaged in financing foreign purchases and imports, are transferred from the Department of Commerce and from the Reconstruction Finance Corporation to the new Office of Economic Warfare. "11 The general principle sought by the Board of Economic Warfare thus was established. The new Office of Economic Warfare was to administer the foreign purchase program and to carry on the functions of BEW. Authority to unify and coordinate "the policies and programs of the agencies engaged in foreign economic matters in conformity with the foreign policy of the United States as determined by the State Department" was placed in the hands of the Director of the Office of War Mobilization.12 This shifted to Mr. Byrnes the problem of unifying the activities of OFRRO, OLLA, OEW, and the State Department. attention of the President to the need for such action. The Wallace-Jones dispute provided the final argument. The creation of OEW was the first step. But nearly 3 months elapsed before the final action, the creation of the Foreign Economic Administration, was taken. On October 6, the final consolidation of foreign economic functions took place under the authority of Executive Order No. 9385. The functions of the War Food Administration and of the Commodity Credit Corporation with respect to the procurement of food, food machinery, and other food facilities, in foreign countries, were transferred to and consolidated with the Foreign Economic Administration. An exception to this consolidation was made in the case of sugar produced in the Caribbean Area and food purchased in Canada, both of which remained with the War Food Administration. On November 6, 1943, the Department of State abolished the office of Foreign Economic Coordination and announced the appointment of four groups of advisers to be "concerned respectively with the foreign aspects of matters relating to the allocation of supplies, of wartime economic activities in liberated areas, of wartime economic activities in eastern hemisphere countries other than liberated areas, and of wartime economic activities in the other American republics".16 Five days later the Department of State and the Foreign Economic Administration reached an agreement concerning the proper role of each agency in the conduct of foreign economic programs. This agreement covered the entire range of problems which had perplexed both the Department and the several operating agencies for more than 18 months. Important among its provisions was one providing for a method of settling differences or disagreements which might arise in the field or in Washington. outside of the consolidation, points of friction had been reduced in number and a far-reaching administrative reorganization had been accomplished. A merger of operating agencies such as those concerned with foreign economic relations produces friction and confusion, and for a time delays effective action till the inertia of established working habits and habitual procedures is overcome. This inertia is the more severe when one of the organizations in a merger is part of an established department with a long tradition of procedure. It therefore took time for the Foreign Economic Administration to become an effective instrument, but once it had settled down into an assumption of its new duties, it conducted foreign economic affairs without any further major change during the war. It handled the continuing burden of lend-lease exports, which reached their peak in 1944, the programming and licensing of exports to friendly nations, and other matters of economic warfare. Its responsibilities increased toward the end of the war. It determined questions of American economic policy for the areas that were liberated as the armies advanced, administered the reverse lend-=lease transactions that became more important the longer our armies were abroad, and directed the search for German assets concealed outside Germany. Investigations by the FEA preceded later diplomatic action against those sources of Nazi strength based on assets concealed in safe havens outside the Reich. The struggle that preceded the final organization of the Foreign Economic Administration, the hesitations and delays, were not exceptional in the Government during wartime, but they were not so inefficient as they looked. Government experience during the war strongly suggested that preparations for administration must remain flexible and adapted to change, even when changes may mean temporary dislocation of function. The real threat to efficiency was careful blueprinting for a rigid organizational structure which would make change to meet new crises almost impossible. The complexity of modern society and government forbids any accurate foresight of what may come and a rigid system of organization sacrifices future gain to an immediate ease of operations. 1. State Department, Departmental Order No. 1114, Dec. 4, 1942; White House Press Release of Nov. 21, 1942. 2. Department of State Bulletin, Mar. 27, 1943, vol. VIII, No. 196, p. 256. 3. The selection of this type of organization was based upon the recognition that (1) there must be one central point in Washington for the coordination of interrelated activities abroad, (2) there must be a similar point in each liberated area, (3) interdepartmental machinery is the technique best adapted for close and continuous working relations as well as unified policy decisions among related agencies, and (4) such coordination within the Department of State did not remove the authority of individual operating agencies as already provided by statute, Executive orders, and so forth. 4. It is instructive to note that the OFRRO-Sate Department struggle under the June 3 letter was similar in many respects to the OFRRO-Lend-Lease struggle under the March 19 letter. In the first instance, the State Department was coordinating; in the second, OFRRO. In both instances, the coordinating agency was placed in the difficult position of being called upon to do an impartial coordinating job when at the same time they had an agency interest at stake. Under the March 19 letter, OFRRO was given "directive" power; State was not given such power. It subsequently requested it but such authority was not granted. 5. Executive Order No. 9128, Apr. 13, 1942, 7 Federal Register 2809. 6. Congressional Record, vol. 89, pt. 5, p. 7260. 7. Clarification and Interpretation of Executive Order No. 9128 of Apr. 13, 1942, in respect to Certain Functions of the Department of State and the Board of Economic Warfare, May 20, 1942. 7 Federal Register 3843. 8. It is important to note that the BEW-State Department relationship involved approximately the same problems as those encountered by the OFRRO-State Department relationship in the spring and summer of the following year. These relationships have already been recounted. 9. 8 Federal Register 908-909. 10. Congressional Record, vol. 89, pt. 5, p. 7260. Letter of Mr. Jesse Jones to Senator Carter Glass, July 5, 1943. 11. Executive Order No. 9361, July 15, 1943, 8 Federal REgister 9861. 13. Executive Order No. 9380, Sept. 25, 1943, 8 Federal Register 13081. 14. White House Press Release, Sept. 25, 1943; Department of State Bulletin, Sept. 25, 1943. 15. The agencies and activities consolidated were: Board of Economic Warfare, Office of Lend-Lease Administration, Office of FOreign Relief and Rehabilitation Operations, Reconstruction Finance Corporation, Commodity Credit Corporation, United States Commercial COmpany, Export-Import Bank of Washington, Rubber Development Corporation, Petroleum Reserve Corporation, Cargoes Inc., Office of Foreign Economic Coordination, Metals Reserve Corporation, Defense Supplies Corporation, and Defense Plant Corporation. IN the case of the RFC and its subsidiaries and the CCFC, only those functions pertaining to foreign purchasing were transferred to FEA; in the case of OFEC, only those operating functions and personnel determined to be such by the Director of the Bureau of the Budget, were transferred; in the other cases, the transferred were of entire organizations. 16. State Department, Departmental Order No. 1210, Nov. 6, 1943.